While most people regularly schedule annual doctor check-ups and biannual dental appointments, a surprising number of those people have never seen, or rarely see, an eye doctor. 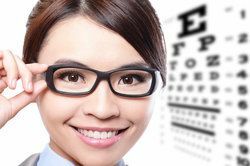 The practice of regular comprehensive eye exams can be beneficial to all patients, not just those who suffer from vision problems. Beginning in childhood and continuing on through adulthood, patients should schedule comprehensive eye exams at least once every two years, or once a year if the patient exhibits certain risk factors. Monterey County Eye Associates is an eye care center dedicated to helping patients maintain good overall eye health. By providing our Monterey patients with comprehensive eye exams, we can monitor vision and overall eye health so that any troublesome conditions can be detected and treated in their earliest stages. Vision screening: It is important to have your vision regularly checked. It is normal for patients who are already being treated for vision impairment to experiences changes in vision that require a change in prescription. For younger patients, vision screening can detect visual problems that the patient has not been able to describe to parents or teachers. While a child who has never experienced clear vision may not understand that blurred or unfocused vision is not normal, it can still greatly affect the ability to complete regular daily functions. Vision screening is important in ensuring that all patients receive effective vision correction when it is needed. Checking eye alignment: If the eyes are misaligned, it can lead to turned or crossed eyes, or an inability for the eyes to work together to properly focus images. Not only can this lead to visual problems, including depth perception, but without treatment it may develop into permanent vision impairment. This is a condition that can be easily diagnosed and treated with a comprehensive eye exam. Checking for eye disease: Although eye diseases such as glaucoma and cataracts can have permanently damaging effects on the eyes, in their early stages, they often exhibit no obvious symptoms. By the time symptoms do occur, eye diseases have often progressed significantly. A comprehensive eye exam allows our eye doctors to examine all aspects of the outer and inner eye so that any eye diseases can be detected early on. Early treatment can significantly decrease the risk of permanent vision loss. Detection of other systematic diseases: Eye exams do not just allow us to monitor eye health but can also indicate signs of certain systematic diseases. By examining the blood vessels around the eye, our doctors can detect signs of high blood pressure, high cholesterol, and other medical conditions that may require your doctor’s attention. Comprehensive eye exams should be a part of every person’s preemptive health care routine. By monitoring eye health, our doctors can ensure that any problems that develop are treated in their earliest stages, therefore reducing the risk of permanent eye damage. To ensure that your eyes are properly cared for, schedule an appointment at Monterey County Eye Associates at your earliest convenience. We look forward to meeting you!